A pub chef and manager have been jailed after a woman who ate a Christmas meal they served died from food poisoning. 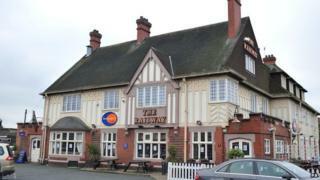 Della Callagher, 46, died after eating at the Railway Hotel in Hornchurch, east London in December 2012. Chef Mehmet Kaya and Ann-Marie McSweeney were found guilty of perverting the course of justice and jailed at Snaresbrook Crown Court for 12 and 18 months respectively. They had fabricated food safety records relating to the cooking of turkey meat. Image caption Della Callagher's family said her death was "avoidable"
Mitchells and Butlers (M&B), the chain which owned the pub, was fined £1.5m for placing unsafe food on the market. The court heard that on Christmas Day 2012 the pub served lunch to 128 customers. Thirty-three of them suffered food poisoning. But the turkeys prepared the day before were not cooled properly after cooking and not adequately reheated before being served to the guests. Clostridium perfringens bacterium, a common cause of food poisoning, was later found in samples taken from the diners who fell ill. The court was told food safety records had not been filled in so McSweeney, who had worked at the hotel for 24 years, concocted a plan for her and Kaya to falsify them. The jury heard Kaya, 38, from Purfleet, Essex and McSweeney, 40, from Suttons Avenue, Hornchurch, retrospectively filled in due diligence logs before health inspectors could carry out an investigation. Prosecutor Andrew Campbell-Tiech QC said it was "highly likely that other food-related records were fabricated". His Honour Judge Alastair Hammerton said the evidence revealed "systematic failings" in record keeping and that McSweeney was "in charge and in control of the cover-up". Judge Hammerton said M&B took "manifestly inadequate steps" to address the risks of inadequate cooking, cooling and reheating of turkey. New cooking instructions were not adequately passed on to staff, and the company fell "significantly short" of appropriate standards. Following the sentencing Mrs Callagher's husband, John, said: "All three defendants appear to have little or no idea what long term damage their actions and in some cases their lies have done. "My daughter will now grow up without her mother by her side and that is unforgivable. Della can never be replaced"
Kaya and McSweeney were acquitted of a charge of placing unsafe food on the market.